Taking care of disabled dogs is a unique responsibility. The challenges both you and your dog face are much different from those of taking care of dogs with no disabilities. It takes special people to take care of special dogs. Because of their disabilities, most of them need special items to help them have better lives. These items also help dog owners take better care of their dogs. These can be essential things that will help them get better or live normal such as prosthetics and wheelchairs. They can also be small items that help make life easier, safer and healthier, such as dog shoes. In this article we will talk more about the importance of dog shoes and how to choose the best ones for our dogs. Initially, most people saw dog shoes as more of a fashionable accessory for their pet dogs. It was more of an accessory that dog owners bought to make their pet dogs look good when going for a walk or to the park. Eventually, pet owners found that using dog shoes do have other advantages aside from the aesthetic. They are a very good form of protection for dog’s paws when walking on extreme conditions such as the beach on a sunny day or walking in cold snow. In addition, they can also help dogs get a better grip when walking on slippery surfaces because they usually come with non-slip soles. Dog shoes are even more useful for disabled dogs. For some, these may even be necessary. What may be second nature for normal dogs are challenging for disabled dogs, and dog shoes are just one more aid that makes it easier for disabled dogs to pull through these challenges. Walking and standing are probably the major challenges disabled dogs have to face daily. Making use of prosthetics, a wheelchair and other tools are definitely helpful. Augmenting this by wearing dog shoes is a plus. For starters, dog shoes give dogs better grip on the floor, which helps them control their movement better. It gives them better control when turning and slowing down. It also prevents sliding on slippery surfaces. Better grip also means better traction. This means it takes them less effort to move around. Dog shoes gives added leg support. This is especially true for the lower part of the leg specifically the wrists. Some dog shoes are even designed to give support up to the middle part of the legs. Dogs recovering from injury or surgery and those undergoing physical therapy are most likely to reap this benefit. Having added support for the wrist and lower leg prevents dogs from getting injured during exercises. It also helps support the muscles and in turn helps strengthen them. It protects dog’s paws and legs. 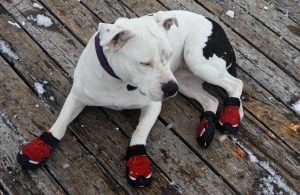 Aside from protecting their legs and paws from the elements an extreme weather, dog shoes also protect the paws and legs from scratches, scrapes and wounds. This is especially true for dogs that cannot use certain limbs. This could be because of weak muscles, nerve degeneration, or bone problems. In many cases, they drag their legs or paws when they move around, and this leads to scrapes and worse open wounds. This is a major concern for highly active disabled dogs that manage to go everywhere despite their disability. Having them wear dog shoes lessens the occurrence and degree of these injuries without having to curb their exuberance. 1. Safety and comfort –Make sure the design and materials used are safe and comfortable for your dog’s fur and skin. It should be non-toxic and not rough on the skin. It should fit snugly without being tight as this could cause poor blood circulation, which could cause even more problems. 2. Grip – The sole or bottom part of the shoes should have a firm grip and not cause slips when walking on smooth and slippery surfaces. Slipping is one of the most common problems of disabled dogs. The dog shoes should be able to address this problem. 4. Terrain – Most dog shoes are appropriate for different terrains, but ask anyway to make sure. It is best to get an all-terrain type of dog shoes. 5. Waterproof – It is not always necessary, but waterproof shoes would be a good idea. You and your dog will be ready for anything.